Home / ACE Festival / children / FEATURES / I Theatre / plays / values / The Jewel in the Tale: A Review of I Theatre's "Under the Dragon Moon"
The review was written for local family portal Little Day Out, a Singapore-based website that provides information and updates on the best of Singapore for families with young children. 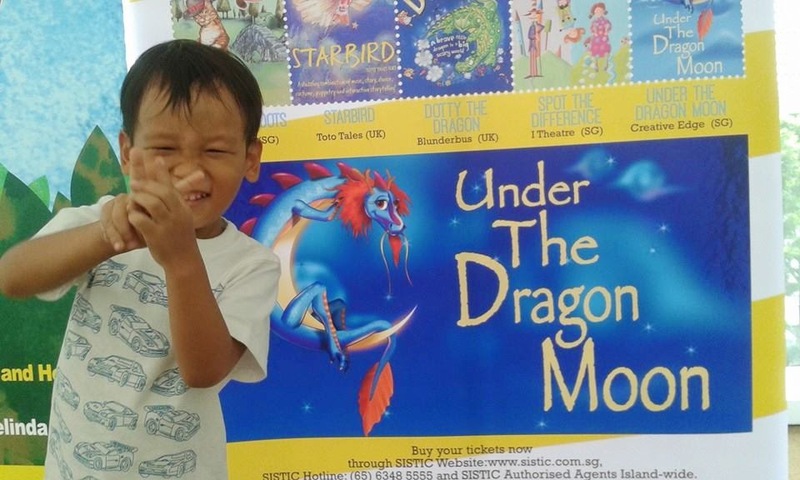 A fun-filled Daddy-Son outing for little Z.
Legend spins the tale of two kindly and graceful dragons, which cared for all creatures on the earth by guiding and healing them. The Dragon of the Seven Seas and the Dragon of the Four Winds also gathered people under the silvery moon to tell stories that would either make them laugh, make them puzzled, or make them cry. And each story always had a “Jewel in the Tale”, a treasured value or precious lesson for the people to learn. But the Emperor of the Mountains was jealous of the dragons, and he transformed them into stars that glittered in the night sky. The only hope was for people to continue gathering every time the dragon stars were highest in the sky - the night of the Dragon Moon. It was said that stories told under the Dragon Moon would never be forgotten; and if people were able to gather enough jewels, that they would be able to save the dragons from their starry fate. Thus begins the premise of Under the Dragon Moon, a re-telling of five Asian stories each with a “Jewel in the Tale”. 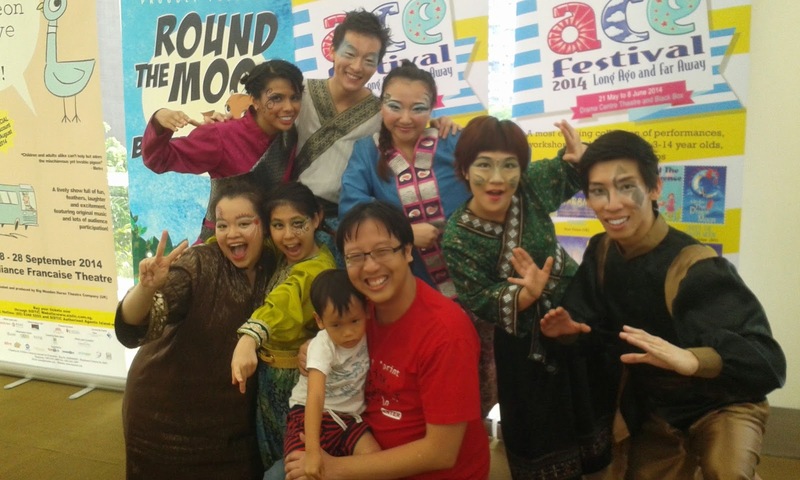 I Theatre’s choice of the five Asian tales reflects its emphasis on how each story should have a moral, and the five tales depict values such as kindness and compassion, humility, care for the environment and even the ability to laugh at oneself. For instance the Indian story The List of Fools narrates how Mughal Emperor Akbar the Great instructs his wise man Birbal to gather ten fools for his amusement. He however learns at the end of the day that he himself was the greatest fool for coming up with the idea in the first place. This reviewer was however most moved by the Japanese tale The Crane Maiden, which tells the story of how an old man’s kindness in saving a crane ends up with the crane maiden weaving bolts of cloth to help the old man and his wife out of poverty. Under the Dragon Moon stole the hearts of its audience largely because of the strength of its stellar cast. The acting ensemble of storytellers (aka Jewels) pranced their way round the audience and into their imagination. The vocal narration was crisp with believable Indian and Filipino accents. Costumes were lavish; and the use of colour and fabric as theatrical elements added to the visual and emotional imagery that made the stories believable. However, it is this reviewer’s opinion that the spectacular dances were the raison d’etre of the show. These incorporated elements as diverse as Chinese opera, Japanese traditional Mai dance, and Filipino percussion music. The production is recommended for audiences from 5 to 18; although this reviewer’s almost 4-year-old son thoroughly enjoyed it too. Z commented that he liked the show very much, especially the lighting effects. What is certain is that the pre-production playful antics by the actors definitely contributed to audience enjoyment, with the characters running in-between the seats, tapping individuals on their shoulders, and even dragging people to play “tag” with them. Under the Dragon Moon is part of the ACE! Festival 2014, and runs from 30 May to 1 June. Click here to read the Little Day Out article.